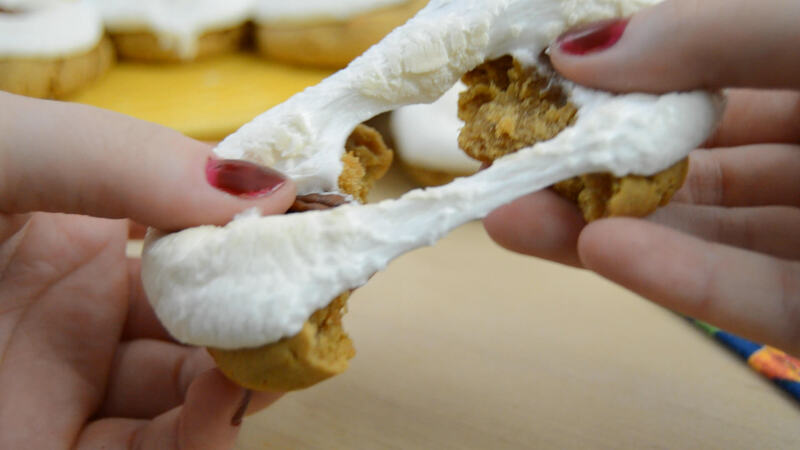 Today we are making sweet potato marshmallow cookies - it's how I imagine sweet potato casserole SHOULD be served; as a dessert and not a side dish. I've always been suspicious of sweet potato casserole, but these cookies hit all of the right notes while also making sweet potato casserole into the dessert it deserves to be. While traditional sweet potato casserole can be overly sweet, my sweet potato cookies carry a mellow flavor that doesn't make your sweet tooth fall out like the casserole version tends to do. 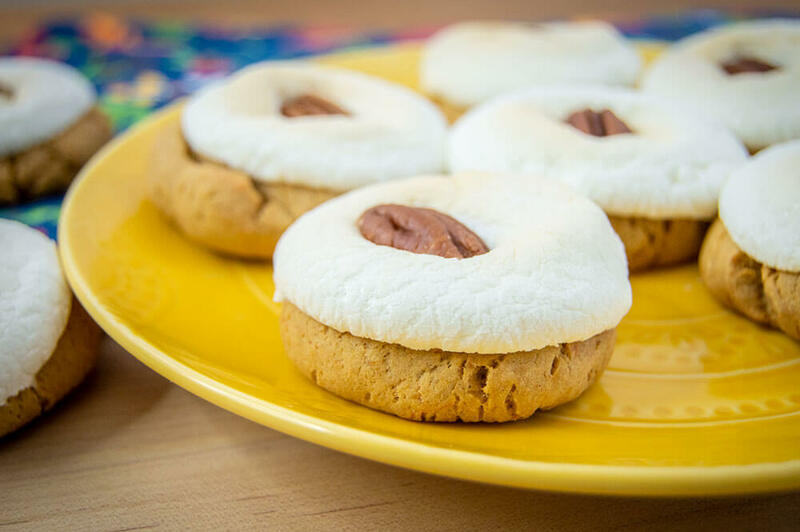 Sweet potato casserole can safely be retired now that these cookies are around. In a microwave safe bowl, add the chopped sweet potato and water. Microwave for 5-6 minutes, or until the sweet potato is tender. Transfer the sweet potato to a separate mixing bowl. Add the butter and let it melt for a few minutes on top of the still-hot sweet potato. Use a hand mixer to whisk the sweet potato and butter together until the mix is light orange. Stir in the brown sugar, molasses, honey, lemon juice, sea salt, cinnamon, nutmeg, ground cloves, vanilla and baking soda. Add the egg and stir until completely incorporated. Add the flour, one cup at a time, stirring between each addition until a thick dough forms. Chill for at least one hour. Preheat the oven to 350 F. Use your hands to roll the dough into individual balls. Arrange the balls of dough about 2 inches apart on a baking sheet lined with a silicone mat or parchment paper. Use the bottom of a flat glass or bowl to flatten the balls of dough to be about 1/2 inch thick. Bake the dough for 5-6 minutes. Remove the half-cooked dough from the oven. Place a marshmallow onto the center of each cookie, pressing gently so that the marshmallow melts and holds it's place. Return the cookies to the oven and bake for 5-6 more minutes, until the marshmallows are golden brown and puffed up. Do not overcook the marshmallows. 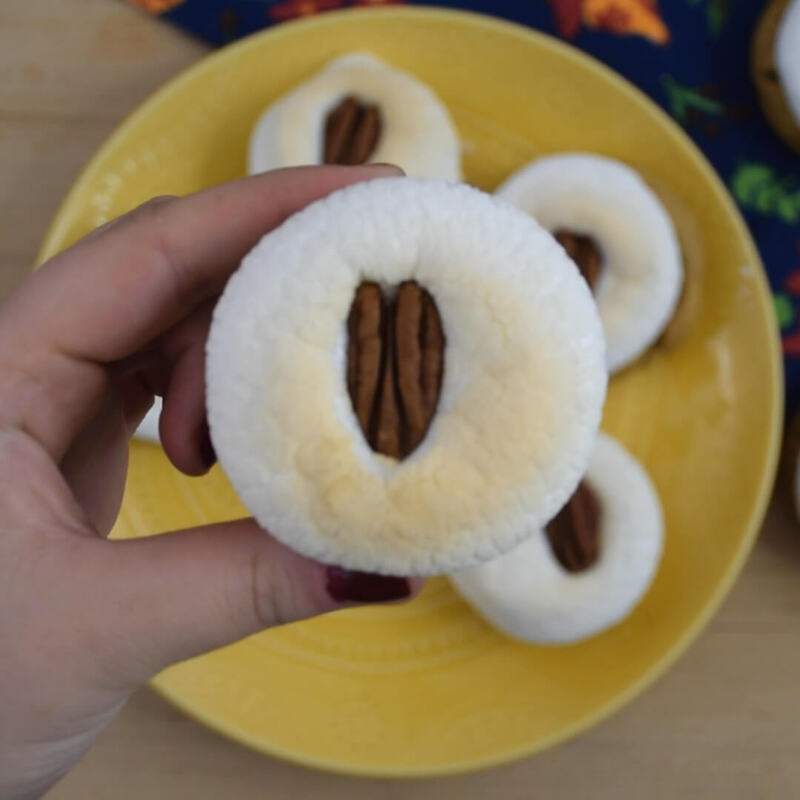 While the marshmallows are still warm, place as many pecans on top as you desire (I placed a single pecan on each of mine). 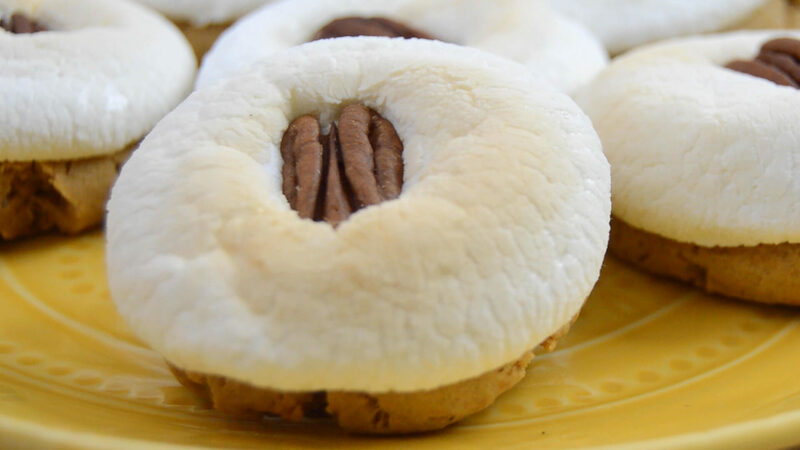 OPTIONAL: Sprinkle a tiny bit of salt onto each cookie or use salted pecans for a boost of flavor. Serve in lieu of sweet potato casserole. Enjoy!